On December 11th members of PEN American met in the Center’s offices to send messages of solidarity and support to imprisoned writers and their families around the world. Does this matter? Will the letters even be delivered? Jennifer Lanthier, an author and activist with PEN Canada, has written a book that tells us that a letter and a stamp arriving from around the world carries a powerful message. 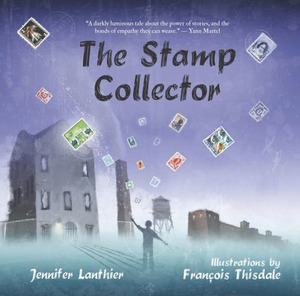 Her book, The Stamp Collector, is illustrated by François Thisdale and published by Fitzhenry & Whiteside. It’s a picture book for children – and adults. The Stamp Collector is set in China. In the story, a country boy who loves books and a city boy who loves stamps grow to be men separated by background, position and prison bars. The country boy becomes a writer who is locked up for his dangerous words; the city boy’s dreams don’t buy bread and he becomes a prison guard. As years go by letters from around the world arrive for the writer, but he is not allowed to see them. The guard keeps the stamps and files the letters. With exquisite prose and dreamlike illustrations the author and artist bring these two men together in a forbidden, heartfelt closeness that liberates the guard, brings comfort to the writer that his words will live on and brings the reader to tears. A portion of the proceeds from The Stamp Collector will support PEN Canada in its efforts to bring hope to writers in prisons around the world. In your bio, you mention your volunteer work with PEN Canada. What prompted your involvement with PEN? In 2009, PEN Canada sent out an appeal for volunteers to help as advocates for writers in prison. At the first meeting I attended, we met the exiled writer Jiang Weiping, who had just been released from prison where he was sent for investigative reporting into the now-disgraced but then very powerful Bo Xilai. Weiping told us that guards are given no information about prisoners’ crimes. But letters to a prisoner, letters from Canada, might be a clue that they had a poet rather than a thief in their midst and they might treat that prisoner less harshly. I left that meeting and spent the next three days writing The Stamp Collector. Why did you choose to write a picture book about an imprisoned writer who does not survive his incarceration? That’s an excellent question. If you set out to write a more commercially doomed book, it would be hard to top a picture book that delves into the messy, uncomfortable world of freedom of expression, and – just for good measure – kills off a main character. And I’d always said I’d never write a picture book. But this story wrote itself very quickly and then stayed what it was, no matter how much I wished it could be a fat YA novel or a layered screenplay. It’s not the easiest book to read aloud. I have difficulty getting through it without my voice cracking. It’s not actually the bit where the writer dies—it’s the part about the library. I come from a long line of librarians and the very concept of a library is so powerful. Every time I read the book, I find myself hoping against hope that the writer will make it there. But of course he never does. I could tell you that I firmly believe we are never too young to think about the importance of empathy, friendship, hope, the power of our voice and yes, freedom of expression – and that would be true. And I could cite other examples of serious or socially conscious picture books, such as The Composition or Sadako and the Paper Cranes. But all of that implies that I made a conscious decision about what to write and I honestly don’t feel that I had a choice. It wrote itself and it was a picture book. It is with great interest that I read about the workshop you have developed for presenting The Stamp Collector to young people in schools. I find your approach to teaching “the power of words” innovative and effective and would appreciate your sharing some of your ideas and experiences. I find working with The Stamp Collector effortless. No matter how old you are, the illustrations by François Thisdale will transfix you. And very few students of any age are familiar with PEN, but they are all fascinated once you start sharing stories of authors, bloggers and journalists around the world. Figuring out what age this book is for seems to be really vexing for booksellers and teachers alike. A major bookstore chain in Canada began by slotting The Stamp Collector in reference, then moved it to Story Time (ages three to five) and now has it in Teen Fiction, where it usually languishes near the Twilight books. Lately, several reviewers have pegged it at grades three to six. But for workshops, I find it works best from about grade four straight through to the last year of high school. I bring postcards of the art from the book and sticky labels for writers in prison, so that the students and teacher can, if they choose, literally act out that aspect of the story. I tailor my talk based on age of the kids but the creative writing exercise stays largely the same. I might present the book to the halfway point and then ask students to finish the story. Or I might ask the students to write a diary excerpt for the guard or a poem or a few paragraphs of memoir which the writer might have scribbled on the walls of his cell. No matter what age, most of these students will produce deeply moving work. They all seem to connect powerfully with the notions of fear, being shunned, having your voice censored or stifled. But they also grasp the hope in the story, the importance of our shared humanity, and our ability to shine a light where there is darkness. I believe the high school kids can cope with statistics and details of writers who are tortured, threatened, imprisoned or killed around the world and in some countries very close to home, such as Mexico. But a little disturbing information goes a long way with elementary school kids. So we’ll talk about how, back in the 1930s, the president of PEN was a writer by the name of H.G. Wells who was trying hard to get the world to care that in Germany a group of people called Nazis were burning books. But when we talk about what’s going on today, I only lift a corner of the curtain that I yanked back for the high school seniors. Your book has universal appeal. Has there been interest in foreign rights? Is there any discussion of translation into Chinese? You’re very kind. I think it’s universally applicable but I don’t know if it has universal appeal. Freedom of expression makes a lot of people uncomfortable. It’s messy. If you’re for it, sooner or later you’ll find yourself defending the right of someone to say something you fundamentally oppose. Kids can name lots of celebrities who lend their names to charities that fight poverty and diseases, or help build schools or wells. They can’t name a lot of celebrities who speak out for PEN. I’d like to think of the book being translated and read in North Korea or Russia or China. And I wish I could send a copy to Nurmuhemmet Yasin or his family, to Ai Wei Wei or Liu Xiaobo. But I doubt any of those things will ever happen. The executive director of PEN Canada did give a copy to the head of Uyghur PEN at a conference this fall and that made me indescribably happy. The book hasn’t had many reviews in America but here in Canada reviewers almost always include information about PEN and writers in prison. The world so easily forgets about writers in prison whether they are in Iran, China, Mexico, Syria – any number of places. And we don’t even know if Nurmuhemmet Yasin is still alive. But there is power in saying a name, I believe. Every time a reviewer mentions Nurmuhemmet Yasin it gives me hope. Josanne La Valley is a member of the Children’s Committee of the PEN American Center. She is the author of The Vine Basket (Clarion, April 2013), the story of a Uyghur girl under threat of being sent to work in a factory in southern China when she must leave school to help on the family farm.